Hey everyone! I would like to start by saying a HUGE thank you to Andye for allowing me to read and review this book for her blog. I had my eye on this since I saw it on one of Epic Read's ARC parties, and I am so grateful that I was able to read it. If you're interested, feel free to check out my blog at Beneath the Jacket Reviews! Review: Let me begin by saying that I am not someone that reads a lot of non-fiction in general, and especially not when I am selecting my own books. I know that there are some people out there that can read non-fiction constantly, but I am not your girl for that one. Still, when I first saw the information about this memoir, I was instantly intrigued. Perhaps it is because I am a teacher and see bullying in schools, and I feel so strongly about making it stop. Perhaps it's also because I just care a lot (sometimes TOO much, I'm told), so this book seemed right up my alley. No matter what the reason, I knew that it was a story that was going to tug at my heart strings before I even began reading. One of my favorite things about this book was the beginning, and how we are introduced to Paige. It isn't just, "Hello, my name is Paige and I was born HIV positive." Instead, we are given some background information about her as a child, before she knew the truth, when she was just a little girl who wanted to have sleepovers and compete in pageants like every other little girl her age. Her mother obviously worked very hard to take care of her daughter and protect her from all of it for as long as she possibly could. We are also told how she ended up being born HIV positive, how her mother ended up dealing with the same thing. While I don't think that it is necessary for me, I do know that some people would be very quick to judge if they did not have this information and were to read the book. I believe that one of the most heartbreaking things about the book (who am I kidding, there were tons of moments!) was that it was one of Paige's best friends who ended up first spreading the information to the school. 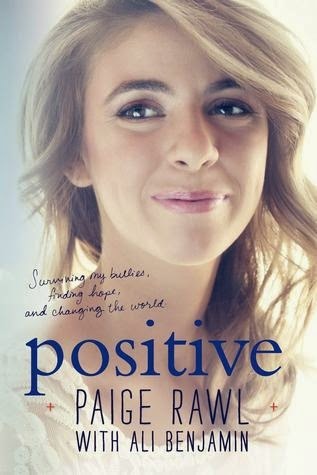 She had been trying to make her friend feel better, and poor Paige did not realize it was a big deal to be HIV positive. She thought that she could trust her friend, but within minutes she had the information spreading. Of course, with middle school kids, suddenly Paige had AIDS instead of just being HIV+. I felt that Paige handled the situation so well, though. Sure, she was upset, but she hid that. She did not lash out at her friend, she did not even talk to her about it. In fact, they never spoke again. I am not going to say that this is an easy read, it certainly is not. There is a lot of heartbreak and upset, and there were so many times that I wished I could reach into the book and hug Paige, and her mother. Man, her mother is one amazing woman! I went through all of the emotions while reading this book. I was happy when Paige was happy because she did have some good days, and she had some friends that stuck with her and stood up to her. I cried when she was so hurt that I am not sure I would have made it through if I was in her position. I was angry as I read about the school counselor telling her to simply pretend she was not HIV+ or her coach when she told her mother that it might help them win games, that the opponents would not want to come near her. I wanted to yell at so many people, and thank others for being the kind of person we need in the world. I love how Paige grew from and overcame the things that she went through. Sure, she had to leave her middle school because it was so bad, but she found an amazing high school that accepted her, and even did research so that they would be able to give her the best attention and care possible. She began to talk in front of people about what she had been through. Then, as she realized that she was treated unfairly at her former middle school, I cheered with her as she decided to file a lawsuit against them. I knew she was doing the right thing, too. I work in the school system, and I know that the way they treated her was completely against the law. Paige was able to make good things happen out of the horrible things that she had been through, and that made her so strong. Stronger than all of the people that ever put her down. There was a part at the end that really got to me, too. She talked about the suicide rate of young adults, and how most of them stem from some kind of bullying. I sat on the couch and cried and cried because I've known of some of these kids; I went to school with them, I taught in the building they attended school, I had even spoken to them in the hallways before they decided that life was just too hard. Life doesn't have to be so hard though, if we can just learn to not be so narrow minded and cruel, but to be accepting and supportive. I think that everyone could learn a strong, important lesson from this book. Needless to say, I gave this book five stars, and I highly recommend it to everyone.